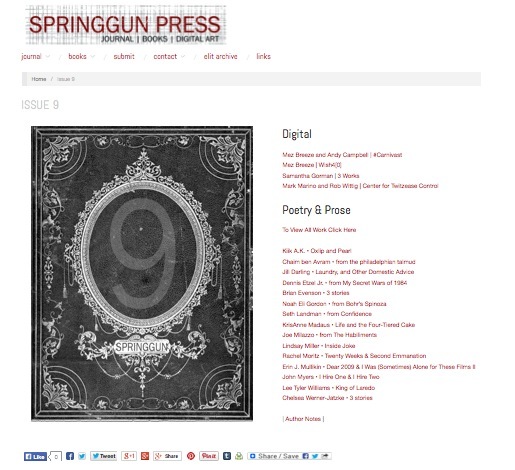 I’m happy to report that Springgun Press, a great progressive literary house, is featuring the collaborative netprov project Center For Twitzease Control in its issue 9. We’re so honored to share the issue with Samantha Gorman and the legendary Mez! Mark C. Marino and I dreamed up the rules of the game for enter for Twitzease Control after he wondered aloud what a Twitter virus might be like. We wound up with a wonderful set of small, language-based Twitter games that were super fun to play. You’re welcome to play the games with your friends! Conspire with them or spring them on them by surprise and see if they catch!